Polyandry is a practice, referred to the women who marry more than one man, or have physical relationships with more than one man, throughout their lives. Polyandry is prevalent since ancient time, since the time of Mahabharatha, where queen Draupadi had five husbands, the five pandavas. Although this practice has been stopped now, and is no more a common affair, but in some remote areas, it is still celebrated. Especially in villages of eastern India, where the female population is very low as compared to the males, and so, to maintain the balance and to prevent males from remaining single all throughout their lives, ‘polyandry’ is practiced. In ancient India, kings and rulers of dynasties, practised ‘Polygamy’ widely. Polygamy is the act of having multiple wives. From King Dasaratha of Ramayana, to many Islamic people, polygamy is widely practised, even today! 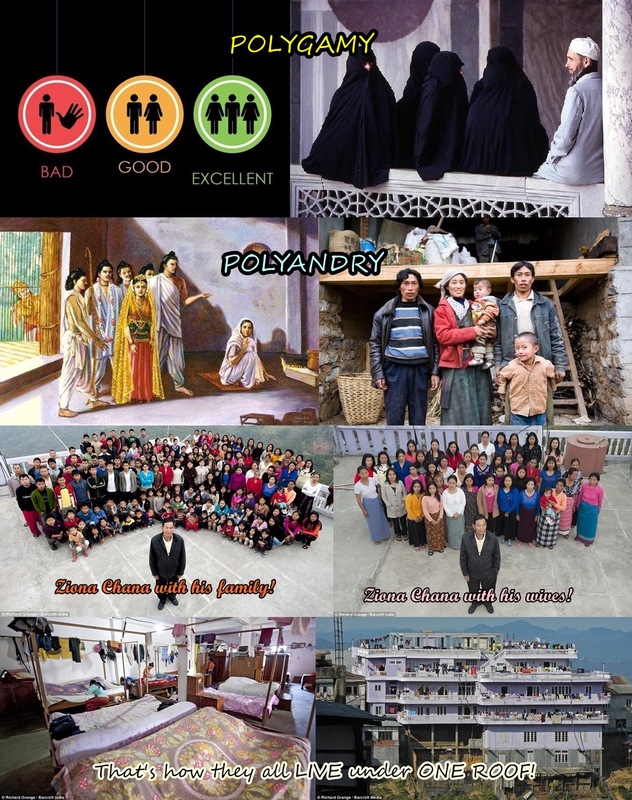 Muslims believe in polygamy and still have multiple relationships. Islam allows polygamy, and a man can have up to four women, if he can afford them. But all these relationships are with consent of all the partners. The deal is made, and further marriages are done. Guys anyways find it to be ‘fun’ to have more than one girl in their lives, but personally, I feel that true relationship can be established only with one partner. Shahjahan had fourteen wives, but his love for Mumtaaz Mahal is eternal and still alive, in the form of ‘Taj Mahal’, which is now gracefully acknowledged as one of the Seven Wonders of the World. No doubt he had a big fat family, but still, he was inclined to only one of his wives, and that was Mumtaaz. Polyandry and Polygamy is widespread in wildlife creatures, especially bees. But the animals who can feel emotions for their partner, like penguins, dolphins or elephants, choose to have only one partner for a lifetime, and so should humans do. Human beings have feelings for their partner, they feel jealous and possessive, and they want themselves to be the most special person in their partner’s life, and not someone else. Even the mere concept of having multiple partners shocked me. In some far away villages in East India, the practice of ‘Fraternal Polyandry’ is prevalent. Women marry all the brothers of her husband, and they live happily together, and even have children. Similarly, in Islam, even today, men have multiple wives, and then they raise gigantic families. The record for having maximum wives, still alive, goes to Ziona Chana of India. He has 39 wives and 94 children, and more than 40 grandchildren. He lives in a four storey house with over one hundred rooms, with his giant family. A family that could be declared an independent village! They consume around 200lb of rice and more than 130lb of potatoes daily! That’s a lot, right? Well, it sounds fascinating, to have such a HUGE family of your own, but managing so much, without any disputes, is another saga altogether. Mr. Chana, being the head of the family, although handles all the important decisions, but he hasn’t allowed his any son to get married to more than one wife. That’s pretty strange, for a man, having around 40 wives, to not allow any of his children to have multiple life partners. All his sons work for a living, managing so many women is an expensive task, by the way! I believe having multiple partners destroys your personal lives. With guys being so possessive, and girls being so manipulative these days, one can’t even think of having another partner. Handling one peacefully is already like finding oasis in the desert, well, Sahara Desert! Nowadays, people already suspect their partner for cheating and infidelity, and they can even kill them for that, let alone allowing them multiple affairs. If you can’t tolerate your partner being comfy with someone else, then how do you expect him to do the same for you? The question is, with so many people (men or women) going for multiple relationships, can they tolerate their partners doing the same? The answer is ‘NO’. With a survey conducted on Islamic men, researchers found out, that they keep their women in hijabs, just to ‘hide’ them, even from the eyes of other men. Can they allow their ladies to sleep with other men? Never! And then, they themselves indulge in polygamy and have multiple relationships. Where is the equality? I’m not targeting Islam in particular, the question is not for any one religion or sect, but on the entire population who involve in polygamy or polyandry. Before you do something like that, just imagine your partner doing it, and then go ahead. If you are comfortable with the thought of sharing your partner, only then share a part of yourself with someone else! That was, My Take On: Polyandry and Polygamy!